Arnott and Vederoff Ancestors - From left, Gregory Vederoff, Grace (Curran) Arnott, Lynell Arnott, "Susie" Arnott. At the home of Grace in Crested Butte, Colorado, around 1992-1995. From left, Gregory Vederoff, Grace (Curran) Arnott, Lynell Arnott, "Susie" Arnott. 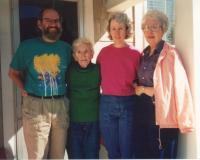 At the home of Grace in Crested Butte, Colorado, around 1992-1995.